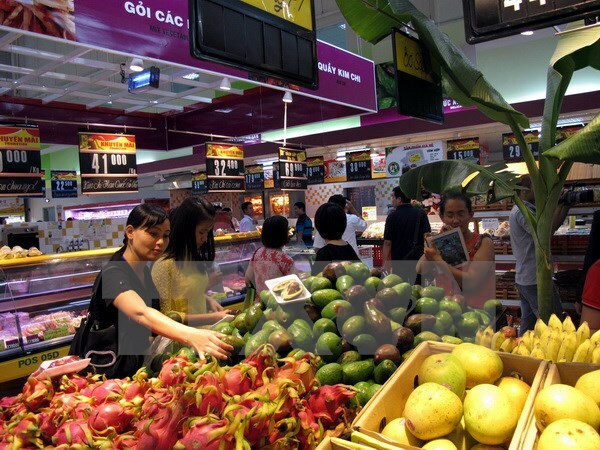 Hanoi (VNA) – The country’s total retail sales revenue reached nearly 2.24 quadrillion VND (98.6 billion USD) in the first seven months of this year, representing a year-on-year increase of 10 percent. In July alone, the figure exceeded 327.6 trillion VND (11.4 billion USD), up 1.19 percent compared with the previous month. Revenue of the group of food and foodstuff, accommodation and catering services saw noted increases from 10.7 percent to 11.6 percent while that of cultural and educational services experienced the lowest rise of 4.84 percent, reflecting that the demand for such services remained stagnant due to their online prevalence. The remaining groups expanded from 7.75 percent to 9.6 percent. Disregarding price hikes, the total retail sales and services revenue stood at 8.7 percent, higher than the rate recorded in the first half of this year. Experts forecast that in August and the remaining months of this year, the goods market will continue to be affected by rains and floods, which will push up prices of products and services. However, thanks to the good supply sources and close coordination in controlling prices of products managed by the State, there will be no sharp increases in prices, they said. To continue effectively implementing solutions stimulating production, ensuring supply sources, curbing inflation and stabilising the macro economy, they suggested the People’s Committees of provinces instruct local households to have suitable breeding plans. Specifically, sugar firms should reduce the price and improve their competitiveness in the context that the import tax will be cut to almost zero percent in 2018, they said.